Should the Yankees be Worried About Dellin Betances? 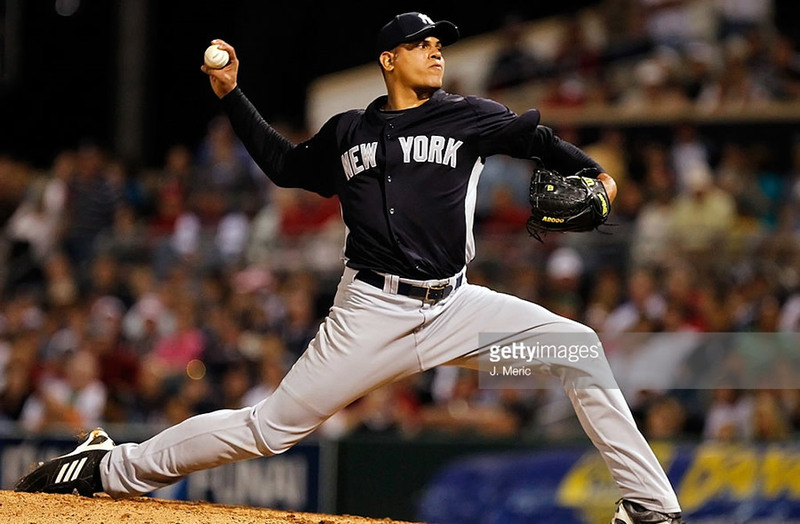 After near-historic dominance as a rookie last season, Dellin Betances is already in consideration to be the Yankees closer for the 2015 season. He showed up in shape and ready to go, but his fastball must have gotten delayed at the airport because it’s not quite there yet. Should we be concerned about his lack of velocity? You can clearly see the difference, but why is this happening? The first thing that comes to mind when you hear about a young kid coming to camp with less life on his fastball is that maybe he’s hurt, or that he’s been overworked, like Betances might have been last season. I’m going to go ahead and eliminate the possibility that age could be to blame (like in CC Sabathia‘s case), because Betances is just 27 years old, but injury or fatigue could definitely be contributing factors. Remember when Michael Pineda came to camp in 2012 unable to throw his normal fastball? He didn’t pitch again until 2014. I’m not saying that’s the case with Dellin at all, but that fear should always be in the back of your head if you’re a Yankees fan. Joe Girardi isn’t worried at all, which I suppose is comforting, but I get the feeling Joe wouldn’t say it if he was concerned–at least not at this point in spring training. Girardi told Chad Jennings that Betances “wasn’t throwing 97, 98 in spring training last year at this time,” and asserted that it usually takes power pitchers a bit longer to get going in March and April. I tend to agree with this, but that’s also what Girardi always said about Sabathia when he suddenly had no fastball a couple of years ago, so I take Girardi’s words here with a grain of salt. Also, according to PitchFX, Betances was throwing 97.5 mph in his debut last April. Did Betances work his way up to that in the last week of spring? It’s certainly possible, but I don’t know. Am I worried? Yes and no. It’s not like Betances is struggling to hit 90 on the gun like Sabathia and Pineda were a couple seasons ago. He’s still in the low 90s, and is topping out in the mid-90s. That’s still fast. If he gets ahold of his breaking ball, he’ll be fine with another mile or two more per hour on his heater. I’m a little concerned that, when the Yankees head to the Bronx for Opening Day, the cold weather will negatively affect his velocity further. If he’s still struggling to hit the high 90s in 80 degree weather, he’ll probably find it harder to do it in 45 degree weather in the Bronx. I’m not ready to hit the panic button yet, but I have my key in the activator and the little hatch to the dialing pad open just to be safe. There is one theory that no one seems to want to talk about. It should be noted that Sabathia came to camp this year hitting 94mph–something he hasn’t sniffed in like two years. Maybe he’s a velocity vampire, and he’s slowly stealing Dellin’s speed. Or, maybe he just ate Dellin’s fastball. That would certainly explain the weight gain (hyooo). I’m just saying… Prove me wrong, kids. Prove me wrong. I’m kidding of course. I really hope, at worse, this is just a mechanical issue, and that Larry Rothschild gets all of this nonsense sorted out in the next week or two. It could also be that he’s only thrown a handful of times so far this spring (he’s basically been on the Mariano Rivera schedule).The Yankees need the best Dellin they can get, and that Dellin throws 100 miles per hour. What do you think? Should we be worried?